For whatever may pose a threat to your vehicle's road performance, our knowledgeable auto specialists provide a number of diagnostic services to get to the root of the problem. A properly functioning exhaust system not only sounds better, it is better - for you, your car, and the environment. We have expert technicians to service your car's exhaust system. Big B's Automotive Services LLC Offers Auto Repair Services You Can Count On! 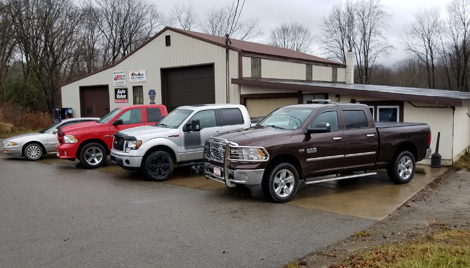 Big B's Automotive Services LLC is the automotive expert in Cambridge Springs, PA 16403. Since, 2012 we've provided the Cambridge Springs area with reliable, affordable automotive maintenance and repair services including 4x4 Services, Alignment, Batteries, Brakes, Car & Truck Care, Domestic Cars & Trucks, Electrical Services, Electronic Services, Engine & Transmission, Engine Maintenance, General Services, Heating and Cooling Services, Import Cars & Trucks, Inspections and Emissions, Miscellaneous Services, Quick Lube Services, Tires, Towing, Transmission Services and Undercar Services. We have experience servicing all makes and models of domestic and import vehicles, and we're honored to keep vehicles throughout the Cambridge Springs area reliable and well-maintained. Our skillful mechanics will take great care of your vehicle too, quickly diagnosing any problems and offering cost-effective solutions to get you back on the road. Call Big B's Automotive Services LLC today at 814-398-8437! You can also send us an email. Either way, we're looking forward to providing you with reliable automotive service!